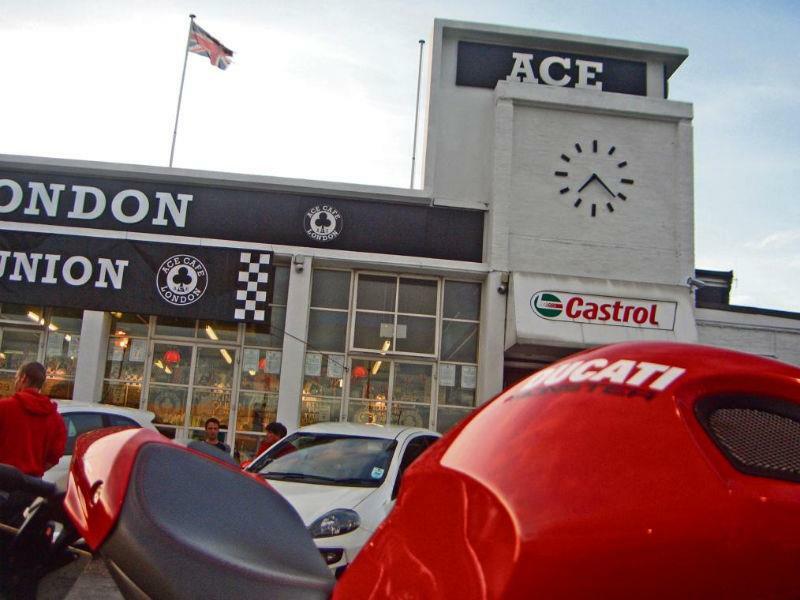 The first Thursday of each month is Italian night at London's Ace Cafe, so before the 160-mile round trip becomes a teeth-grittingly sub-zero affair, I made the effort to head down after work a few weeks back. The promise of clear skies and good company kept spirits high on the 5.30pm slog down the A1, thankfully against the tide of London's commuter traffic. Motorcycles and cars coexisted peacefully on the Ace's forecourt, with a brace of classic Fiat 500s, a flotilla of modern Abarth 500s from Fiat's tuning division and Italian supercars providing a curious counterpoint to the Monsters, Multistradas, 848s, Bimotas and other two-wheeled thoroughbreds. Myself and pal Dave, who'd turned up on his Moto Guzzi V7 Classic, conclude we were both born 50 years too late, lingering over details of gorgeous Ducati 900SS and numerous homebrewed specials and classics. Surprisingly, the Monster was a comfy perch for the blast home. Once away from the gravitational pull of the North Circular, sitting at a good old lick on empty dual carriageways ensured fuel economy was improved over my normal average by about 10mpg - who'd have thought a steady 70mph is better for economy than daily banzai back-road blasts to work?